Boone Aviation News: Join us for the 2010 Boone Area Pilots Assn. Holiday Gathering! Join us for the 2010 Boone Area Pilots Assn. Holiday Gathering! The 2010 BAPA Holiday Gathering will be held on Tuesday, December 14th at the Iowa Stater Restaurant inside the Gateway Center Hotel in Ames. The Iowa Stater is a casual restaurant featuring fun ambiance and a nice selection of "comfort foods." We will be ordering off of their menu and lucky for us, Tuesdays are "$10 On Tuesday" special nights! Normally $20 entrees are just $10! Plan to gather in the restaurant social area at 6:30 for a cash bar and other treats. We'll be seated for dinner at 7 and when we have finished, we can move down to their lobby area for our gift exchange. I thought it would be nice to have everyone bring a plate of Christmas cookies to share during the gift exchange. How does that sound? The gift exchange limit is $10 and please don't include gag gifts this year...we want REAL stuff! Please label your gift as for either a man, a woman or either. If the weather is really bad, use your own discretion. BAPA members are very loyal (!) and we have fought raging blizzards to make it to holiday gatherings. But still, use your discretion and put safety first. If anyone from Boone wants to carpool, let us all know. We could meet at CYA and go from there. If you are coming from out of town, you might consider an overnight stay at the Gateway that night..a fun pre-holiday overnight with your special someone, perhaps? I have asked that you sign up by DEC. 7th so I can let the restaurant know how many to expect. You can email me directly at lkkuehl@gmail.com, or there will be a signup sheet at CYA. Family, guests and prospective BAPA members are welcome to attend with you. Dress is business-casual..or you can get dolled up in your best holiday garb, or don your Cyclone spirit colors! We usually have some sort of little game or program to share, so plan on something fun before opening gifts. I hope we have a great turnout and great weather to go with it! If you have questions, just holler. The Gateway Hotel is near the intersection of Highway 30 and University Boulevard, near the football stadium and Iowa State Center. OH...don't forget to bring your 2011 dues if you haven't paid up yet. Dues are $15 per couple or individual per year. Thanks! See you on the 14th, I hope! 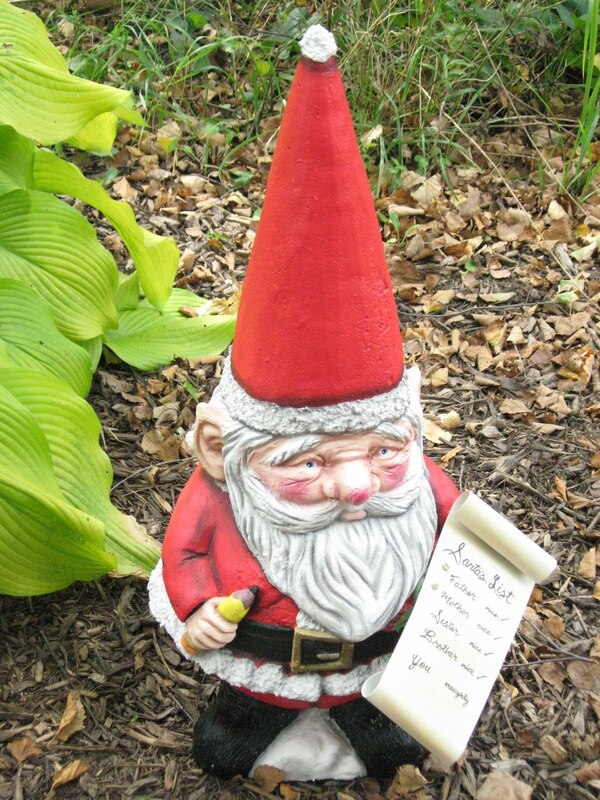 I like the Santa gnome ! Another thought...come early to Ames and you can stop by the always-lovely Reiman Gardens and pay the butterflies and the beautiful botanical garden and gift shop a visit. Reiman Gardens is just down the street from the Gateway and they are open until 6pm. They are also decorated nice for the holidays. Check out their website for a schedule of December events.